I am nine, sitting cross-legged on an elementary-school gym floor that smells vaguely like rubber soles and ketchup. My friends and I are lined up in a row waiting to go to recess or art class or the library. We’re likely wearing scrunchies in our side ponytails and neon shorts; children of the eighties. The girls nearest me lean in, grinning, and say, “We want to tell you something. We’re best friends.” I look back and forth between the two of them, confused, because just yesterday the one with the strawberry hair told me that I would always be her best friend. I ride my bike home alone that day, forlorn, and sit at the kitchen table with a cookie in my hand and my mama across from me. These things happen, she explains gently. I nod, feeling very grown-up and wise, even in my disappointment. I will think of this again when my crush flirts with me one day and holds the hand of a long-legged athlete the next. I will feel it when the conversation with the editor at the conference seems to go so well and then the rejection letter comes in the mail. I will revisit it when the whirling crowd online is landing on my site today and taking off to another one the next like a flock of spring sparrows. It is the nature of humans to be fickle. We put rings on each other’s fingers and then signatures on divorce papers. We are employee of the month and then find ourselves on the lay-off list. We are dear friends and then time and space and life make us drift until we’re looking back at old photos and thinking, I haven’t seen her in a while. Yet we keep searching, hoping, longing for that person who will stay. The constant who will never go away. In these moments, it comforts me to know “Jesus Christ is the same yesterday and today and forever” (Heb. 13:8). He isn’t going to pick someone else on the playground. He isn’t going to bring us roses and then forget to call the next day. He won’t recruit us for the pet project and then neglect to invite us to the celebration party. He won’t use us up and throw us out, pull us close and then push us away, whisper in our ear and then lose our phone number. Because His love for us isn’t based on our charm; it’s rooted in His character. It doesn’t come from His emotions but instead from an eternal commitment. It isn’t dependent on what we do for Him, but what He’s already done for us. It gets even better: Jesus also tells us, “I am making everything new!” (Rev. 21:5). Who He is doesn’t change, yet He moves and pursues in endlessly creative ways. It’s what our hearts long for, what we’re really looking for when we exchange the friendship bracelets or say the vows or sit down at the desk in a new office for the first time. We want to know we can trust, completely, the one with whom we have aligned ourselves. And yet we also want to know that doing so will lead to life and growth and adventure. We want stability and excitement, consistency and change, familiarity and novelty. When we try to demand all of this from a human being, we always end up disappointed. But the answer isn’t to shut down our hearts, to tell ourselves we’re being unrealistic or irrational. Instead, it’s to take those desires to the One who put them there in the first place, the only One who can truly fulfill them. Jesus “is the same yesterday, today and forever” (Heb. 13:8) yet He also says. “I am making everything new!” (Rev. 21:5). Both are what we need. Both are eternally true. I stand at the sink, dirty pan in hand. I smell citrus in the soap, hear the warm water flow, move the brush in circles over the last bits of burnt cheese. I feel small in this space, ordinary and rooted to the ground. I have been here for a long while now, in this kitchen, on this earth, and I silently ask, What’s my purpose? Across the street a mama or grandma might be asking the same as she changes the tenth diaper of the day. Maybe in the center of town someone is leaning her head on her desk with the door closed, just resting for a moment on that stack of spreadsheets and wondering this too. When we ask this question and silence seems to be the answer, we often go searching. We’ll say yes to another opportunity or perhaps run away from it all. We’ll join that cool play group or volunteer at the soup kitchen on Fridays. We might jockey for the promotion or put in the long hours. My purpose is out there somewhere, we think, and one day I’ll find it. But then the opportunity doesn’t go as planned, the giving leaves us empty, and our souls grow pale in the fluorescent light. “Something else will do it,” we say, “Surely it will be the next thing.” And on we go with our gypsy hearts. It’s understandable, this great migration. We live in a culture that tells us the purpose of life is about us. We must find that one thing we are here to do and then all will be well; we will be whole. But when I look closer at how “purpose” is used in Scripture, there’s a different story. The purposes of his heart, the Lord’s purpose, his purpose—over and over when purpose is described, it comes from God and belongs to Him. Also, purpose isn’t talked about much in terms of just individual people. It is more often spoken of as an ongoing thread that stretches through all of history and eternity. It is so much bigger than us. So when we go looking only for “our” purpose, we are disappointed. What changes everything is when we understand that a meaningful life is not just about finding our purpose but joining God’s. The square of earth you are standing on is the only place in all of history and the entire universe where both you and God are right now. It’s where His purposes and you, a person created by Him, come together. This is not small or inconsequential. It is beautiful and powerful. It is holy, meaningful ground. 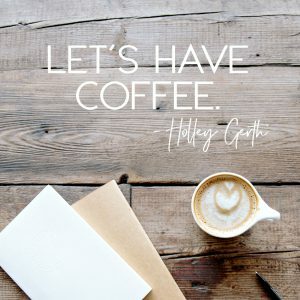 This post is an excerpt from my new devotional, Hope Your Heart Needs: 52 Encouraging Reminders of How God Cares for You. Look for it today at your favorite place for books, or sponsor a child through this link and Compassion will send you a free copy! P.S. If you serve in ministry, I’d love to send you a free book as a thank-you gift! Find all the details here. And, if you’re in the Arkansas/Oklahoma/Missouri area, I’d love to see you at the She Found Joy event on October 26th! It’s going to be a one-night mini retreat. More details here. 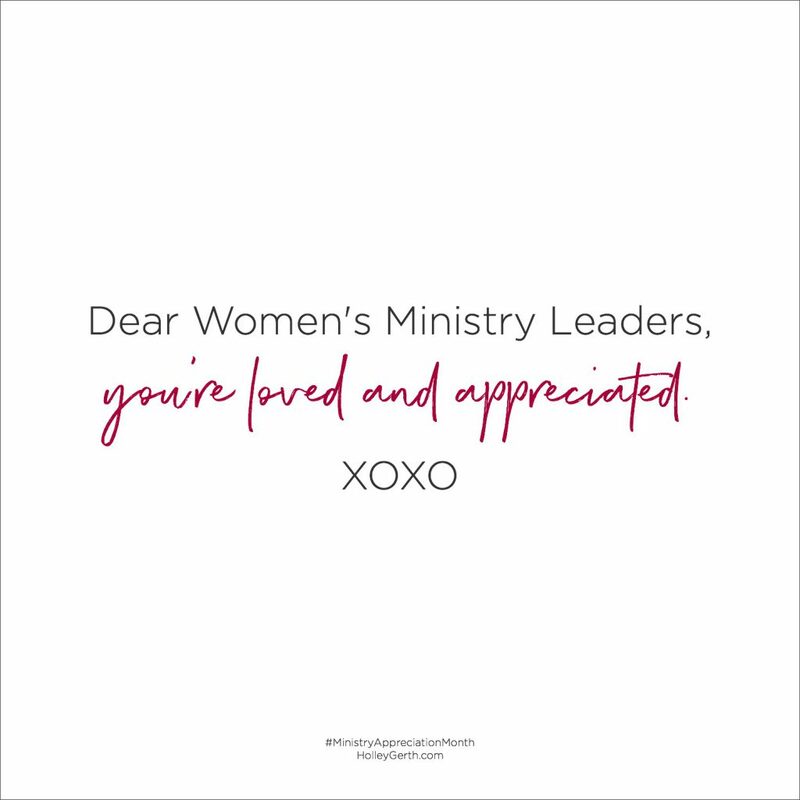 October is Ministry Appreciation Month and we’re thinking of you. When you come to mind, we picture a smile that welcomes others. We imagine your head nodding and tilted to the side as you listen. We hear your laugh and the way you say “amen” at the end of a prayer. We can feel the warmth of your hugs. What you do isn’t easy, especially in today’s world. It’s a brave thing to keep your heart open, to come alongside other women, to show us what it looks like to love like Jesus. Having a soft heart in a hard world is an act of courage. Choosing connection over competition and authenticity over isolation are the kind of choices warriors make. You’re sweet, yes, and also strong—a woman who is here for such a time as this. You’re a light in the dark, a hope-bringer to the hurting, a woman who doesn’t give in or give up. Even the mightiest among us can use encouragement now and then. So hear this from our hearts: You’re making a difference. What you do matters. You help change lives. We’re better, braver and more in love with Jesus because you said “yes” to His invitation to lead us. We feel this way all through the year but right now seemed like the right moment to pause and put it into words you can read and remember, that you can tuck away and pull out again any time you need a reminder of what’s true. You are loved. You are a gift. We’re so grateful for you. 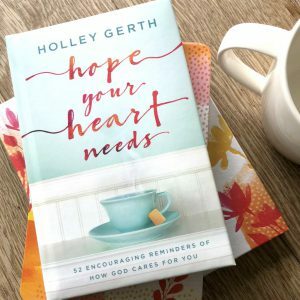 Thank You Gift: If you’re looking for a Ministry Appreciation gift for your Women’s Ministry Leader (or any other woman who’s making a difference in your life) my new devotional Hope Your Heart Needs would be a great fit. 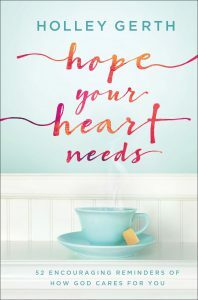 And if you’re a Women’s Ministry Leader at your church I’d like to personally send you a copy of Hope Your Heart Needs: 52 Encouraging Reminders of How God Cares for You, as appreciation for how you’re serving. Books will be given to the first 150 Women’s Ministry Leaders to complete this form. The rough wooden boardwalk is cool beneath my feet as I make my way to the sand. The sky is still the thick, deep blue of night, and gray shadows sway in the salty wind. I sleepily take my husband’s hand. I’m not a morning person, but we’re on vacation and I’m determined to see the sun climb like a rising warrior above the waves at least once. I am greeted by diamonds thrown out on velvet. One star in particular winks brilliantly back at me. I find out later it’s actually the planet Venus, otherwise known as the Morning Star. Here is its mystery and beauty: Venus is known for rising in the darkest part of the night, just before dawn. He is not afraid to step right into the night. Not afraid to even dwell in the middle of it. Because He is light, and in Him there is not darkness at all. This means darkness can surround Him and He cannot be defeated or diminished by it. He came as a baby into a midnight world and announced His arrival with a shining star. He conquered death in a dark tomb and rolled the stone away, making a way into the brightness for all of us. In the thickest gloom, the Morning Star rose. 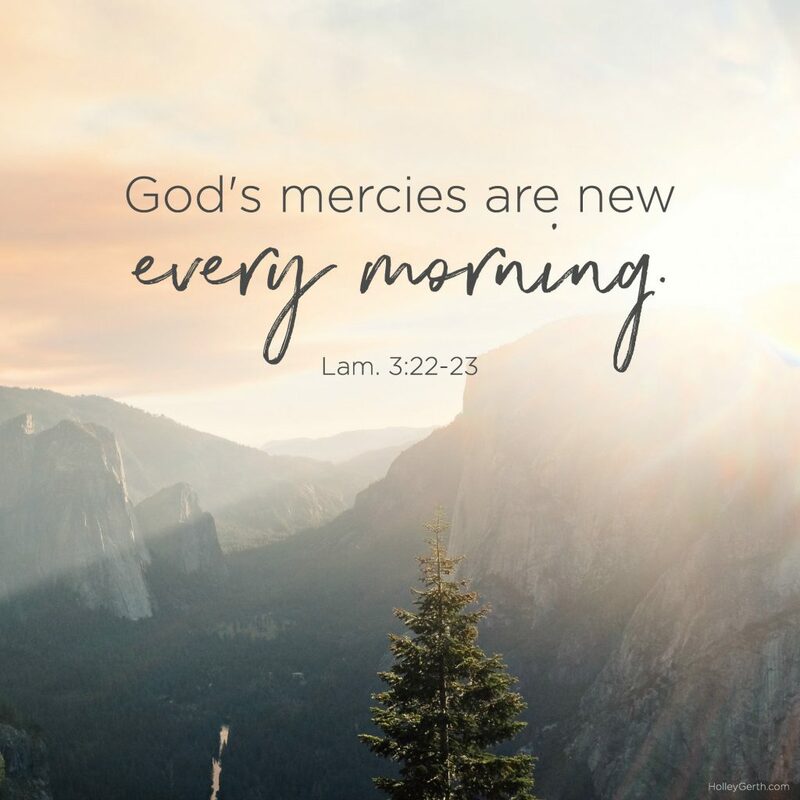 “God’s mercies are new every morning” (Lam. 3:22–23). As I watch the sun slip into the morning sky and fill it with gold and flame, I bear witness that these words are true. Venus, the Morning Star that foreshadowed all this light and blazing glory, seems to be more than just a planet; it suddenly also seems to be a promise. A daily reminder from the heart of our Creator that even the deepest night will lead to dawn. The dark cannot win; the light will never be overcome. This post is adapted from my new devotional, Hope Your Heart Needs: 52 Encouraging Reminders of How God Cares for You. Get it now or read a free excerpt. Compassion is kindly offering to send a signed copy to anyone who sponsors a child through this link. P.S. When you get Hope Your Heart Needs you can get the ebook of You’re Going to Be Okay for $1.99 too – this month only! It’s the answer we all give. Often what we really mean is, “I’m a little tired. A bit overwhelmed. Longing for something more.” In this world, our hearts grow weary. We want hope, joy, peace, and purpose. Surely all of this is around the next corner, we tell ourselves. If we hurry, if we try hard enough, then we’ll find it. One morning I curled up under a cream-colored blanket that felt like the edge of a cloud. I turned on the lamp by my bed and sipped tea from a red cup with a little chip in the rim. I didn’t want this day to be like so many before. I wanted to know the answer to the restlessness in my heart. I needed a real solution. I did an internet search. I texted a friend. But on this occasion, neither of those would do. I reached for my Bible then and flipped through the pages. I began to notice verses about who God is and how He loves us. And suddenly I came to a turning point: I realized what my heart needed wasn’t a simple answer to a problem. No, I was looking for, longing for, a Person. Someone bigger than us. Stronger. Able to handle everything. Someone who will care for us, fight on our behalf, and extend grace to us always. Someone limitless and loving, beyond our imagination, and right there in the intimate details of our lives—always the same and yet forever doing a new thing in and through us…. 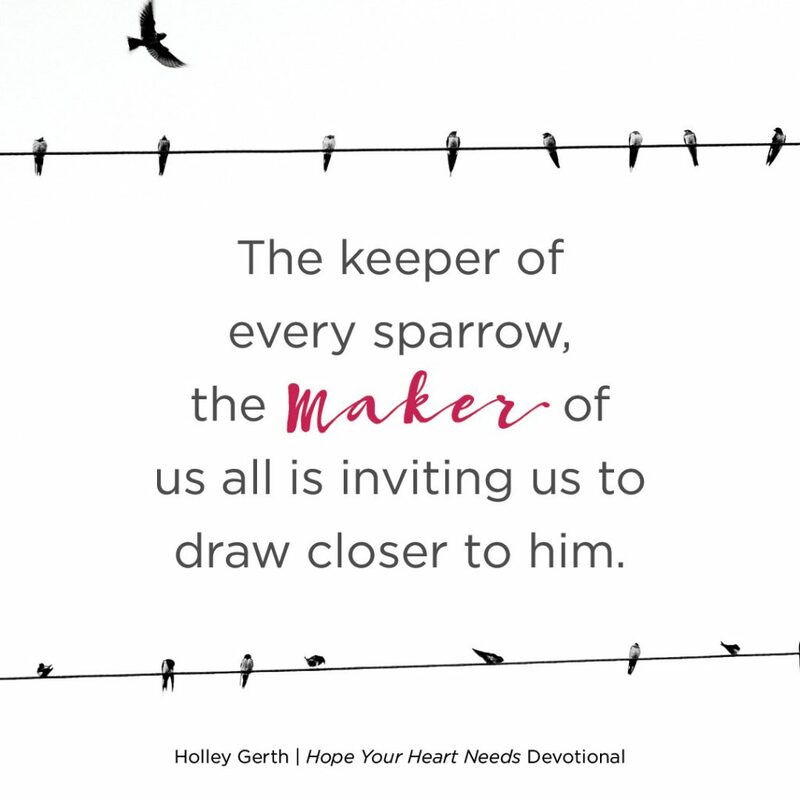 The God who scattered stars like diamonds across the velvet of the universe, the keeper of every sparrow, the maker of us all is inviting us to draw closer to Him. He is the place where our hearts can go on the hard days and the happy ones, in the highs and lows, when we are sad or frustrated or downright giddy. He is what we have been searching for all along. Exciting News: This post is an excerpt from Hope Your Heart Needs: 52 Encouraging Reminders of How God Cares for You (releasing this week!). God used the truths in this book to bring new hope and strength to my weary, discouraged heart and now I’m sharing them with you. Get your copies now or read another free excerpt.